Wednesday March 23rd 1881 It took till nearly noon to get the house cleaned up and I sewed all the afternoon and evening on the shirts. Thursday March 24th 1881 I worked today just as yesterday. Weather rather pleasant and the snow melting of Friday March 25th 1881 I got my share of the house-work done about ten oclock and worked from that till late bed-time on the shirts. Ella Anderson went home for good today and Onie for a weeks vacation. 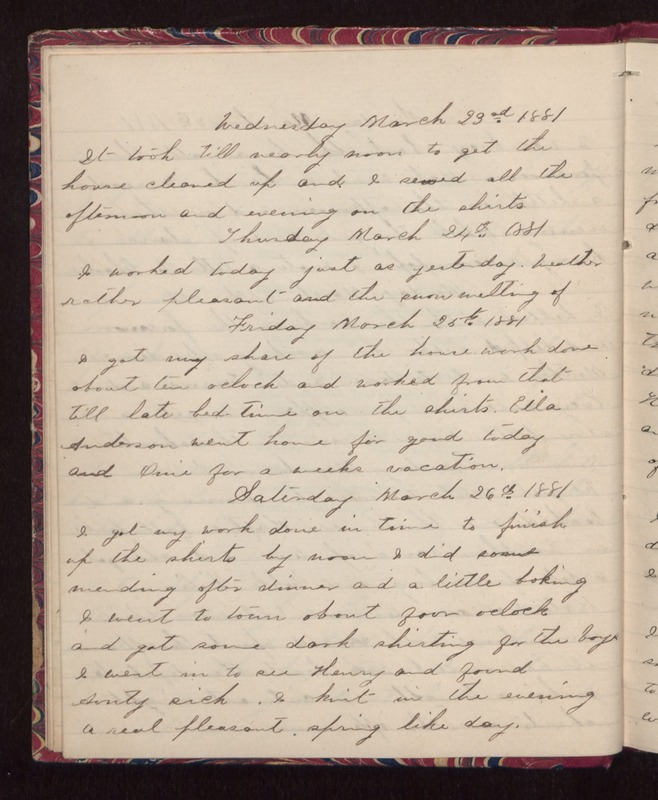 Saturday March 26th 1881 I got my work done in time to finish up the shirts by noon I did some mending after dinner and a little baking I went to town about four oclock and got some dark shirting for the boys. I went in to see Henry and found Aunty sick. I knit in the evening a real pleasant spring like day.